In ancient times the peoples of Europe periodically moved from their homelands to new territories. Just why they migrated is a matter of conjecture and surely differed from case to case . . . . The major reason mooted is overpopulation, which led smaller groupings (rarely if ever a whole people) to move off to find sufficient land to settle on. On occasion pressure came from outside invaders such as the Huns, who pushed various peoples further to the west and caused them to try to find lands in the Roman Empire. Drought or other natural catastrophes might also have forced groups to pull up stakes and look for (literally) greener pastures. All of these points might be understood collectively as push-factors. The migration of the Angles to Kent was probably such a case since it seems that whole clans moved. . . . Pull factors . . . are also often seen as motivation for migration. Raids by bands of young warriors, perhaps younger sons without land, seem to have been quite frequent. While many of them were just that, raids, from which the men returned home with booty of all sorts, on other occasions, they settled in the areas invaded and, after removing the male competitors they had defeated, took the indigenous women as wives. This may apply to the Saxons, whose pattern of settlement in the English Midlands with small and equal allotments suggests a well-regulated system of distributing spoils. 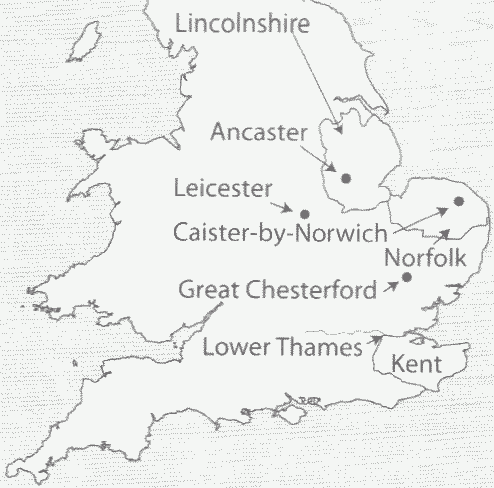 Furthermore, since the Saxons practiced primogeniture, smaller allotments would suffice, while the larger ones in Kent suggest more the Angles' system of gavelkind . . . . / Other pull-factors may be found in the changing structure of Germanic society under the influence of Roman expansion and Roman culture. The Roman Empire represented a high standard of living with well-established associations of power and prestige. In the case of England, even after the withdrawal of the Roman legionnaires there would have been no abrupt change.